Spring is coming up! Why not welcome it with a fresh coat of paint for your fence? Spring is coming up! 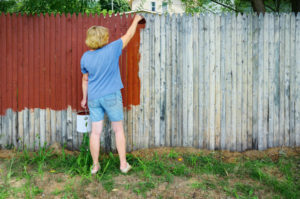 Why not welcome it with a fresh coat of paint for your fence? Your wooden fences will last for a long time, but you need to take the proper care of them. Plus, you’ll want them to look their best for as long as possible. Here are some tips for painting your wood fence for spring. Even if you repaint a worn down wood fence, it still might not look its best. It’s important to perform any necessary maintenance to get your fences into good shape. Once they look great, you can make them look even better with the right paint. You can use a power washer to clean off all the dirt and any other buildups you see. Just because to not cause further damage to your fence. You should also double check the conditions of screws and nails holding the wood fence together. Another option is to sand your wood fence. This technique will help smooth out the wood, making it easier to paint and also increasing its overall aesthetic appeal. Next, you’ll need to choose the color of paint you want. You can also add a layer of stain to your wood fence. You should remember, however, that a stain for a wood fence is not necessarily a bad thing. It’s a type of finish meant to help complement whatever color you decide to paint it. While you might be tempted to choose a darker paint, that might not be suitable for the change of seasons. A bright and cheerful color can make a difference too – so don’t feel confined to white, black, or brown. Why not try something unusual, like red, green, or yellow? Once you’ve got your wood fence looking the way you want, you’ll want some accessories. Choose finials and other fence toppers to give it a bit of personality. You can also choose bird feeders, shadow boxes, or flowers. Just remember to get rid of any weeds! This entry was posted on Friday, March 9th, 2018 at 11:45 am. Both comments and pings are currently closed.